It is blooming everywhere on the island and the warm sun is back. The situation here for most refugees continuous getting worse though. Still there are continuously people arrested and imprisoned. Mostly it is people from four countries: Pakistan, Bangladesh, Marroco, Algeria. Police is targeting these nationalities for their low chances of getting asylum. People continue to have to fear to walk to the city to use the internet or have a coffee, fear to walk to Moria camp to renew their papers or get their cash card. Moria camp is more and more constructed like a prison…even more than before. While the EU celebrates itself for providing winterproof shelters (in March after the cold is over anyways….) it is clear that they don’t do it to improve the well being of the people in the camp. Much more it is another way of control. Moria is now structured into different sections that are mostly made up by containers. Access is only possible for people living in the section and only with a wristband they have to wear. As the repression got worse a task that gained more and more importance in the last weeks is the Anti-repression work some people were doing for some time now. As people are in prison for many weeks or sometimes even months we do our best to support them. For this we currently need support ourselves…people joining us for a longer period as well as practical help for the people in prison. If you want to support contact us by mail! Furthermore we continue to support the several squats with food boxes and other support. Also we are still cooking for Tsamakia. Due to the heavy police presence and arrests of the last weeks we cook now only few portions daily for Tsamakia. 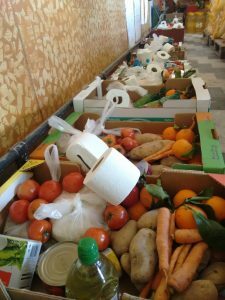 Instead we give out more food boxes and since a few days we are also providing food for some of the local Roma people. Surprisingly there has also been some good news in the past weeks. While the current emptying of the islands means deportation for many it also can mean a ticket to Athens for few. We are happy about some friends who finally managed to legally leave the islands. All of them after struggling here months and many with an uncertain future and another long waiting time in Athens. But still… its one step forward, and we could celebrate a few happier goodbyes in the past month. Keep updated and come by in May or June if you have some weeks to spare…we will need you! Join us in May and June! We are calling out to people joining us from end of April. With the spring in Lesvos the weather got better but the situation on this island is getting worse and worse. While the number of boat arrivals went down the number of people in prison and people facing deportation is going up. There are many reasons for us to be here, there is a lot of work to do. To be able to continue our work we need your support! We cook, we support the people in squats and camps, we fight against this system that criminalizes people looking for a refuge in Europe. Join us and let us fight together. If you think of coming contact us by mail, phone or write us a message on facebook. We especially look for people that can stay for a longer period of time. We welcome all people that share our basic political principals and are happy about a diversity of people and ideas! Today we came together with several hundred of people from different countries to demonstrate for freedom of movement and against the EU-Turkey-Deal. The demonstration was organized by an alliance of refugees from Moria and local solidarity initiatives. Today we demonstrated not only on Lesvos but all over Europe and showed our solidarity with each other and everyone struggeling against Europes deadly borders. 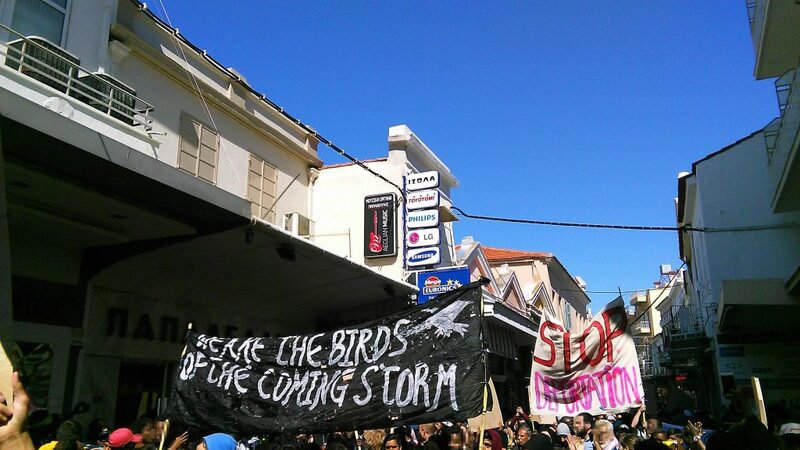 One year has passed since the deal came into effect, one year of people suffering its consequences here on Lesvos. Since the deal Turkey is assumed to be a „safe country“ and people can be and are continously sent back to Turkey instead of getting asylum in Europe. Of course we all know that turkey is not safe at all. In the past we already wrote about how false the assumption of Turkey as a „safe country“ is. Refugees in Turkey face long imprisonment in so called „removal-centers“ without access to a fair asylum procedure, legal support, medical care or decent living conditions. Instead of getting protection refugees are deported back to their homecountries, where most of them have to face war and persecution. One year has passed since the implementation of the deal, one year of people being stuck on the island. one year of people suffering the horrible living conditions in the hot-spots. One year of detention, deportation, violence, hopelessness. It is clear that the deal has to be stopped. Today we were fighting against this deal, against the suffering the EU-borders cause here on Lesvos and everywhere else in Europe and beyond. We will continue fighting here for freedom of movement, for open borders and for the right of everyone to live. Police violence is omnipresent in Lesbos. It happens in the day, in the night, in the street, in the police station, in Moria prison and to people with and without papers.. Every day on this island people are controlled, harassed, humiliated insulted and beaten. The following text is not a complete report on police violence in Lesbos and doesn’t aim to be one. Rather it attempts to give a glimpse into the everyday violence that happens here on Lesbos. All the citations are part of testimonies we collected during the last 3 month. People that the police assumes are refugees are repeatedly controlled on the basis of the color of their skin. When they are stopped in the street they are usually asked to show their papers. We know of several people who failing to show identification were taken to the police station and there they were beaten. They were brought to a separate room in the police station that didn’t have cameras and beaten with fists, kicks and sticks. After this they were released again. At least one person was unable to walk after being severely beaten with sticks and another had his arm broken. People are beaten even while carrying their papers. One person told us that he was arrested in Mytilini. He was not asked to show his papers but instead immediately handcuffed, pushed to the ground and beaten with elbows. Then he was brought to the police station where again he was held down to the ground and again beaten. At no point did the police ask him for his papers or tell him why he was arrested and beaten. After the beating he was released. The containers where people try to cross to the mainland with are another main point where violence takes place. Most people we know that try this way were either beaten or saw their friends being beaten. Again it is similar stories of people being beaten, kicked, insulted by several police officers. Many people traveling to Europe imagine it is place of justice, peace and freedom guaranteeing the human right to seek refugee. But in fact there is no justice or real human rights for refugees in Europe, and especially not on Lesvos. No one here is receiving the rights they deserve and they were coming to Europe for such as respect, safety, morality, love. 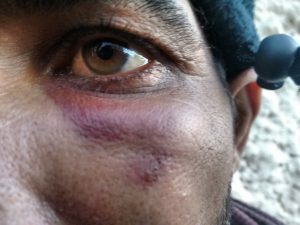 Instead refugees on Lesvos are being abused and threatened by police everywhere and every time. They find violence instead of refuge. The police assume that refugees are defenseless and that they can act with impunity, but refugees are documenting, denouncing, and filing complaints against the police for these illegal actions. We will continue to work together to make visible the everyday institutionalized violence of police towards refugees. So get in touch if you hear accounts of police violence and want to work together on the topic. More and more people that we know on Lesbos agreed to so called Voluntary Return in the past weeks. This comes with the pressure of forced deportations as well as the current wave of arrests and imprisonments. People in danger of being deported or imprisoned in the closed area of Moria camp have the “voluntary” deportation as a sometimes last option to presumably escape more time in prison and a forced deportation. Most people are stuck here since months, for some it’s now almost a year. In fact Lesbos is an open air prison. For some that tried to get asylum and were rejected, that tried to cross to the mainland and failed it is impossible to leave but it is also impossible to stay here. Staying is impossible even if it means going back to a country they escaped for a variety of reasons. Even if it means abandoning a hope they risked their lives for. Another reason why people choose the “voluntary” deportation is that the IOM (International Organization for Migration) bribes the people if they sign for it. It seems that the conditions for deportation vary according to the migrant´s nationality. At the moment we hear that Pakistanis nationals are promised 500€ at departure and another 1500€ at arrival. We were told by people that agreed to the voluntary return that they only received the 500€ and never saw the additional 1500€ (yet) after they returned to their country of origin. 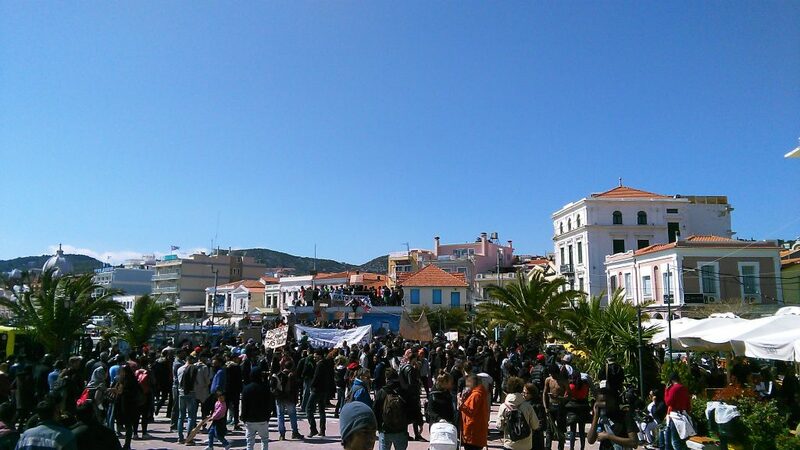 On the other side, Algerians are offered 1000€ if they accept “voluntary departure”. At the moment there is a significant number of Algerian nationals imprisoned in the closed area of the Moria camp waiting for their deportation – some of them since months. Even though the Greek authorities, assisted by IOM, are obviously urging people to register for voluntary deportation, it seems that the administrative and logistic removal system is taking a long time. To agree to voluntary return means spending time in prison in Greece. Some people sign the papers inside of the prison in Moria to be able to leave it again at some point. They have to stay during the procedure, which can take several weeks or even months. Others sign it outside of prison but have to spend several weeks in a prison on the mainland until taking a flight to their country of origin. Some people cannot escape the prison even after their return. Many countries see irregular emigration as a strong enough reason to imprison the returned for several months. We keep hearing stories of people that were imprisoned for 3-6 months in their country of origin. The ones that can leave the prison after a few days or escape imprisonment all together can mostly do so because they have enough money to bribe the police. More often than not, the reintegration assistance, so the money the people receive for the voluntary return, directly wanders into the pockets of corrupt police.